In the spirit of the season, I was trying to think of something “fall-ish” and yummy to make with apples. Of course, it had to be quick and easy because life right now is CRAZY busy! So to make my life easier, I used frozen bread dough for this recipe and no one could even tell. If you are a go-getter, feel free to use a homemade dough . . . but I promise I won’t judge you if you decide to take the short cut and go with frozen dough (you can thank me later!). This makes a delicious snack, dessert, or breakfast! 2 Granny Smith apples, chopped (you can peel them if you would like to, but I didn't . . . it's all about the shortcuts!)? Spray a 9x5" loaf pan with non-stick cooking spray.? 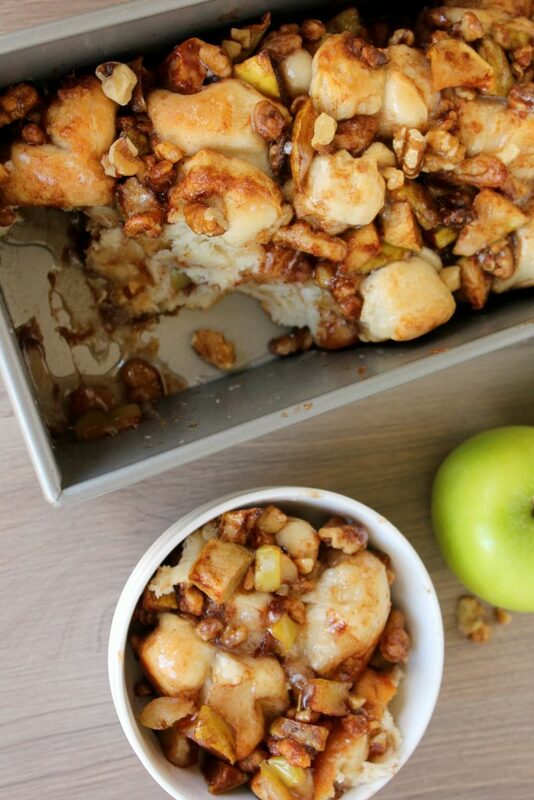 Mix together the chopped apples, brown sugar, walnuts, and cinnamon until well combined.? Using a pair of clean kitchen scissors, cut each roll into thirds.? Place 12 small roll pieces in the bottom of the loaf pan. Drizzle about a third of the melted butter on top of the roll pieces. Then top with a third of the apple mixture. Repeat layers two more times, until ingredients are all used up. ?Let rise for about an hour (or until rolls have doubled in size).? Bake for 30-35 minutes, until tops are golden brown and the middle rolls are done (I lifted one of the rolls in the middle to peak at the layers underneath to make sure they weren't doughy).? Oh Camille this looks yummy! I've been wanting to make a pull apart bread for awhile...just haven't done it yet! Frozen dinner rolls? Are they uncooked or precooked? Uncooked! They are just frozen balls of dough that you can find in the freezer section of your grocery store. Thanks! I'll look for them the next time I'm at the store. This recipe looks fantastic! sounds perfect for these chilly mornings! I have wanting to try a pull apart bread too...and I love that this uses the frozen dinner rolls! I can't wait to try this!!! Camille, this bread looks divine! My mom has made something similar but with pumpkin! Such an easy recipe. I've never made pull apart bread myself! Following Silhoutte on pinterst. Did all the steps to enter giveaway. Thanks so much! I'm new to your blog and love it! AMAZING!!! 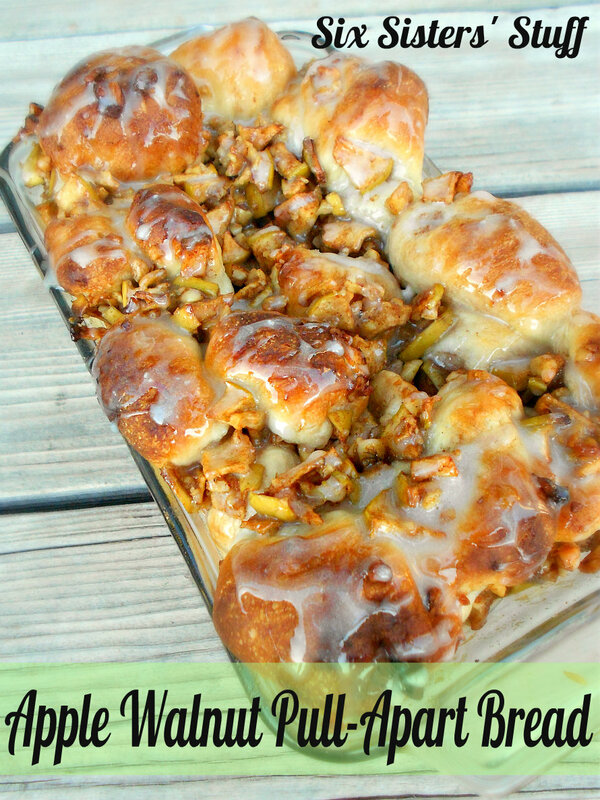 I love pull apart bread, but this is such a fun twist! This is beyond amazing. LOVE it! Ohh, this looks yummy! I would eat this for a snack, dessert AND breakfast! It tastes great, though, for my oven, it needed to bake longer. The center was still pretty doughy. I follow your recipes and have made many, but sorry ladies, this one was a waste of ingredient and time. It was too dry with little taste. It went in the trash with the recipe. I'll keep following. made this tonight and it was simply delicious. Easy to make.i didn't have rolls but loaves of bread. i used on loaf of frozen bread. it worked. Now that I am eating it, I think I would cook my apples a bit before I put them in. My bread is cooked perfect but my apples are still a little raw, more than my liking, anyway. Can this be prepared the night before and then baked in the morning?? It could but it may rise a little during the night. Keep it in the fridge. So yummy for breakfast! What do the question marks mean in your recipe? Sorry about that. Every now and then weird recipe things pop up. It's leftover from when we converted over to our new site. We updated it. Thanks so much! can this be made in the crock pot? We have not tried this recipe in the slow cooker yet.